Got Geophagy? I see some dirt crumbs still left on your plate! 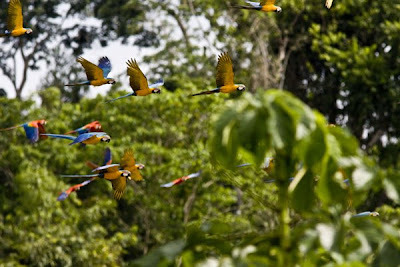 In celebration of Parrot Month at the highly esteemed and much beloved website "10,000 Birds" - my next post on my recent Amazonian adventures is there. Check-out my encounters with clay-eating psittacines, venomous snakes, dangerous spiders and more multicolor birds than you could possibly imagine in one post. "Licking Clay" recaps more adventures and more macaw photography from my recent time working with Alan Lee and the Tambopata Macaw Project as an Earthwatch volunteer in the Peruvian Amazon last November. "I first read - in amazement - about the clay licks at Tambopata some years ago, and I’m delighted that Tim Ryan (who blogs at From the Farway, Nearby) has been good enough to provide a profusely-illustrated account of his visit to Tambopata as a volunteer last year. “One of the ornithological highlights” on the planet? 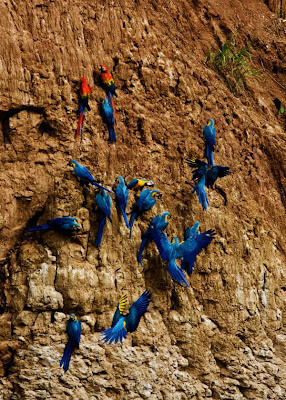 Reading Tim’s account and looking at his (and the Tambopata Macaw Project Alan Lee’s) photos I think that’s definitely a justifiable claim…"
Look at those little guys go!!! Wonderful post, Tim. I have been reading about Earth Institute for a while. I just added another project to my bookmark! Good heavens, honey. Could you please let me come along and tote your bags? I'll be silent and efficient, but having the opportunity to look at the world through your eyes would be glorious. I am visiting all the blogs nom'd for the 2008 Okie Blog awards...just wanted to say CONGRATS on your nom!!! How does one describe that color of blue on those birds? It is outstanding! Candy for the eyes Tim... candy for my eyes... ahhhhhh. Now here's something worth seeing! Thanks for the tip. I'll certainly pop over! I remember my first Nat Geo that had these guys clay licking! Glad you changed that title. Our token dumb blonde was in charge of reading your blog. When we ask her "What's new with T.R.?" She said "He's licking Clay". Outstanding. The photos and writing are both amazing, and I loved the post over at 10,000 birds, too. Enlarge that first photo and frame it, sell it for a large sum of money, or keep it for yourself. My God it's beautiful in every way. congrats on your nomination, TR. Well deserved. ANd, this photo is just wonderful. "Check-out my encounters with clay-eating psittacines, venomous snakes, dangerous spiders and more multicolor birds than you could possibly imagine"